Ladies and gentleman, we’ve done it! Hopefully, you’ve been following us through the year and know one of our New Year’s resolutions was to reach 100 Google reviews. Well, last month we did just that! We completed July with 108 reviews and a rating of 4.9 on Google! 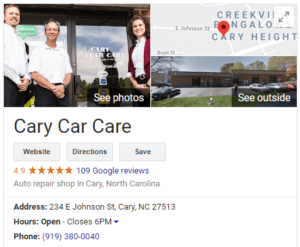 We can’t thank our clients enough for taking the time to share their experiences and spread the word through reviews about Cary Car Care. As for our other resolutions, we have certainly continued to be involved in the community. 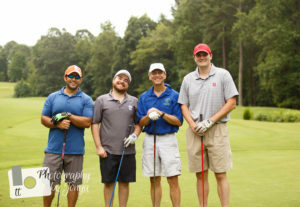 In fact, last week Paul participated in the Meg’s Smile annual golf fundraiser as Cary Car Care was a Silver sponsor. This year, we are excited to announce, we did not come in last place! Additionally, our plan to complete renovations is still in the works with no current time frame except getting it done as soon as possible. We know the renovations we plan on completing will improve our workflow and client experiences. We’re excited to get it underway and will update everyone as that happens. Have you completed any of your New Year’s resolutions? What are some goals you’ve set for yourself? We’d love to hear more about you and what you’re doing to improve yourself. Any suggestions for us? Don’t hesitate to write us any reviews!